I first tried making bread when my sister-in-law invited me to make whole wheat loaves together. I can still remember how fun it was to knead and see the dough rise. And when it was baking, the house was filled with a wonderful smell. Now, I am convinced that nothing is as good as homemade bread. Besides, making bread is an addictive hobby. After reading through The Bread Baker's Apprentice: Mastering the Art of Extraordinary Bread by Peter Reinhart, I feel more confident about baking bread at home without getting scared about the result. It's a wonderful book that explains all the basics of bread baking technique. 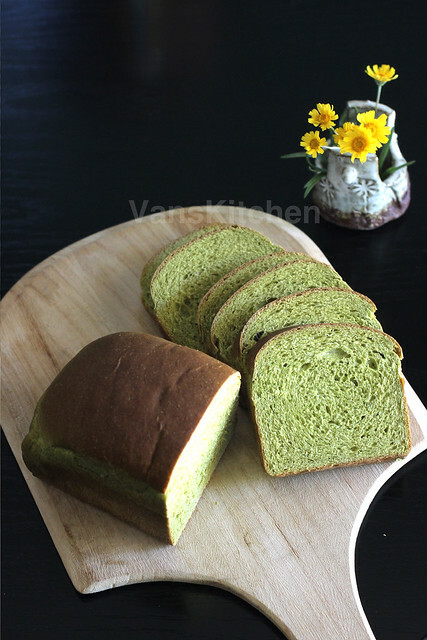 It encouraged me to create my own favorite bread recipes, and this spinach bread is one of them. I really love how it turns out. 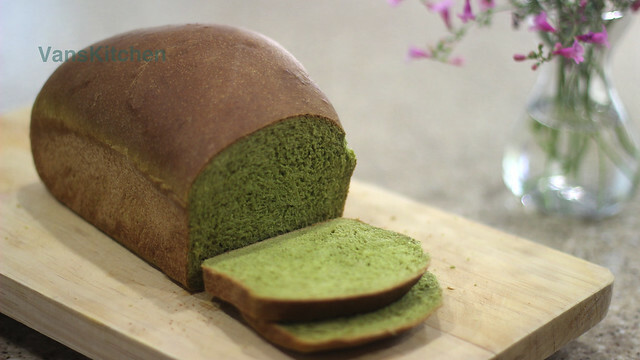 It has a wonderfully moist, chewy and the fresh spinach gave a beautiful green color, but you can't really taste the spinach. 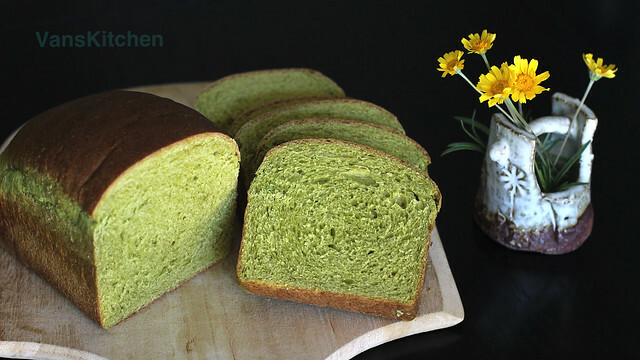 My kids just love this spinach bread. Whether it’s a slice with jam and butter, or a grilled cheese sandwich, it always gets a big smile. It’s a great way to encourage a picky toddler to eat healthy. (*) I used King Arthur brand. You may need to tweak the amount of milk a bit for another brand. Be sure to substitute 2 egg yolks for the whole egg, and sugar for the honey, if your child is under 12 months old. 1) In the blender, combine spinach, salt, egg, milk, and honey. Blend until smooth. 2) In the stand mixer bowl, add bread flour, whole wheat flour, yeast, butter, and the spinach mixture. Mix on low speed with the paddle attachment until all the ingredients combine together; it should take about 2 minutes. 3) Switch to the dough hook, mix on medium speed for about 7 minutes, or until the dough is smooth and only slightly tacky, but not sticky. It should have a soft, pliable quality, not stiff and resistant. If it is too stiff, knead in small amount of water until it softens; if the dough seems too sticky, sprinkle in small amounts of flour as needed. To test, slowly and gently stretch a small piece of dough, turning it in a circular motion as you pull so that it stretches evenly. The dough should hole together without tearing until it forms a sheer membrane, thin enough to let light come through. 4) Lightly oil a large bowl. Shape the dough into a round ball and place in the bowl, roll to coat it with oil. Cover the bowl with plastic wrap. Ferment at room temperature for about 2 hours, or until the dough doubles in size. Punch down the dough for degas, fold the edges of dough to the center. 5) Transfer the dough to the counter and divide it in half for 2 loaves. Form each half into a loaf. Place in the greased loaf pan. 6) Cover loosely with plastic wrap and let rise until double in bulk, about 45 minutes. 7) Preheat the oven to 350°F (180℃). Bake 30 minutes or until the crust is deep golden brown. Remove the loaves to a rack. Cool completely before slicing. Bánh làm xong để nguội cắt rồi phải cho vào ziplock kín không thì sẽ bị khô nhé. Chị cũng đã thử cách làm ủ bột cái qua đêm rồi hôm sau nhồi thêm bột và ủ lại rồi, nhưng nhà chị không thích vì bánh ra light quá, nhà chị quen ăn kiểu bánh mì nặng và chất lượng quen rồi em à. Nhưng nếu em thích bánh mì có texture light như vậy thì làm kiểu ủ bột cái qua đêm vẫn được.